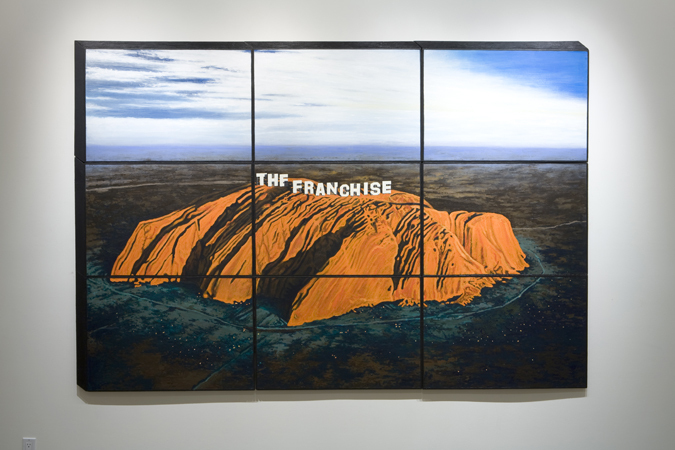 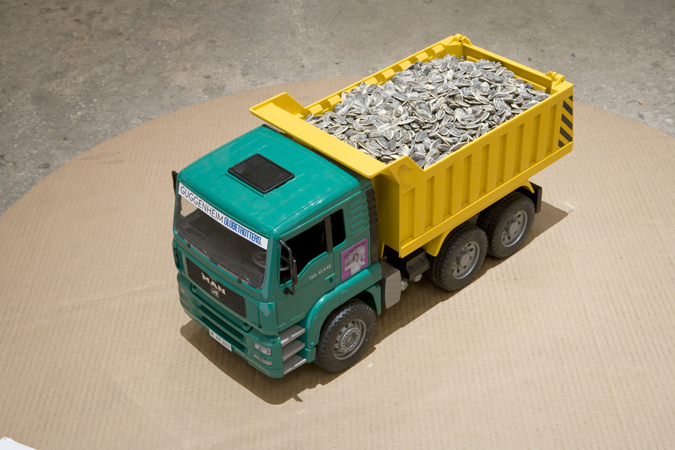 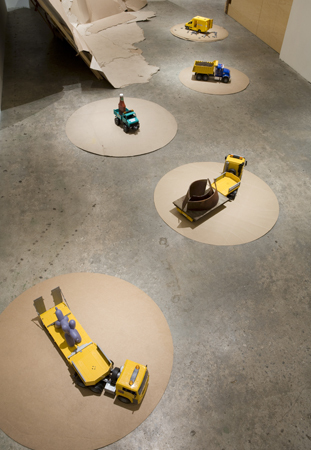 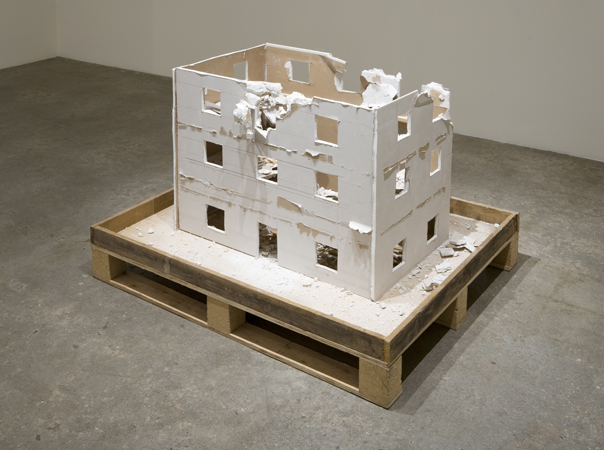 HD Softcore, Installation view, Steve Turner Contemporary, October 2011. 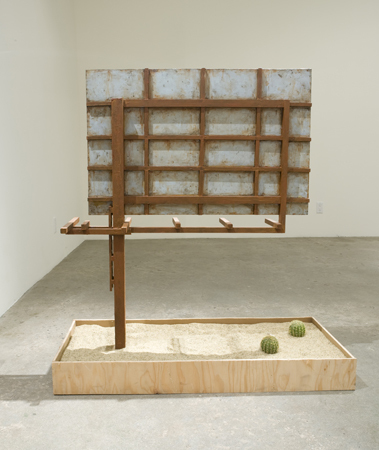 Steve Turner Contemporary is pleased to present HD Softcore, a solo exhibition of new work by Dublin-based artist Nevan Lahart. 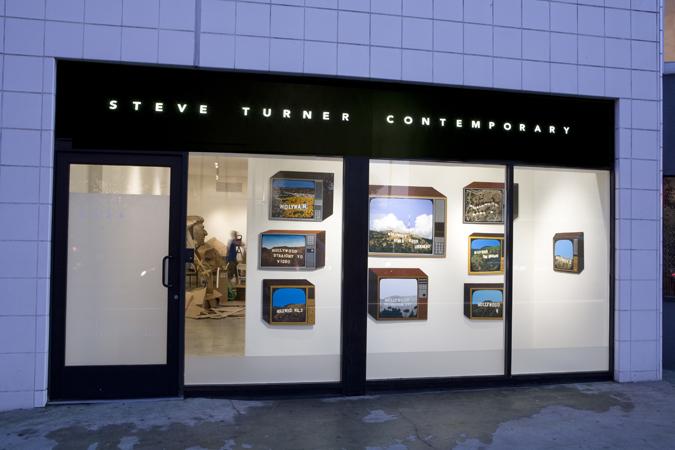 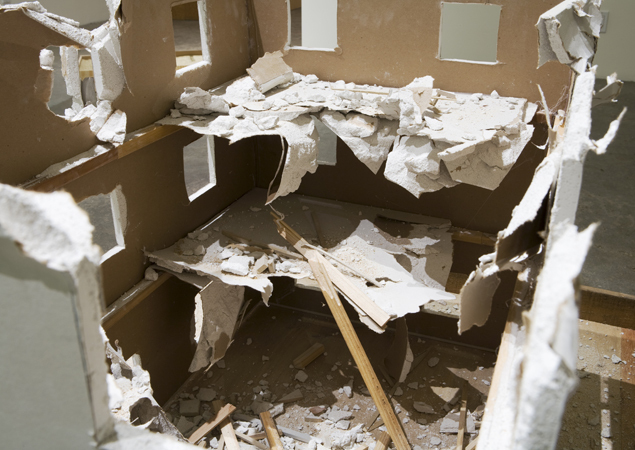 This is the artist’s first exhibition at Steve Turner Contemporary. 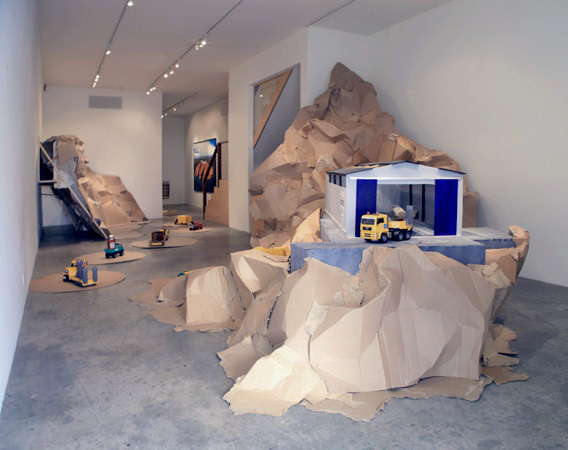 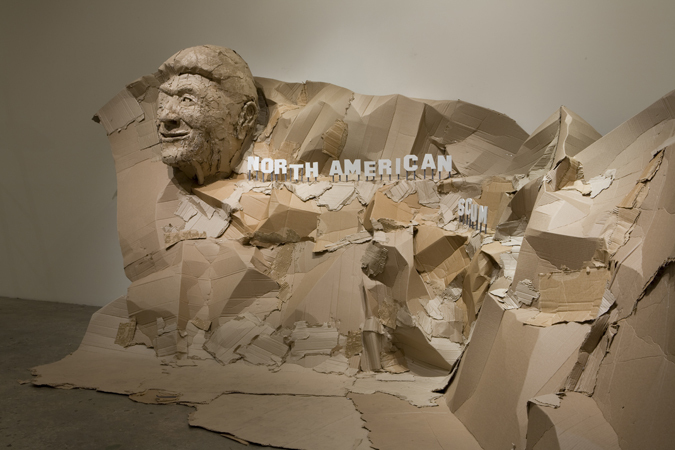 Against the backdrop of a monument to Ronald Reagan, HD Softcore will transform the gallery into an immersive desert landscape made of discarded cardboard. 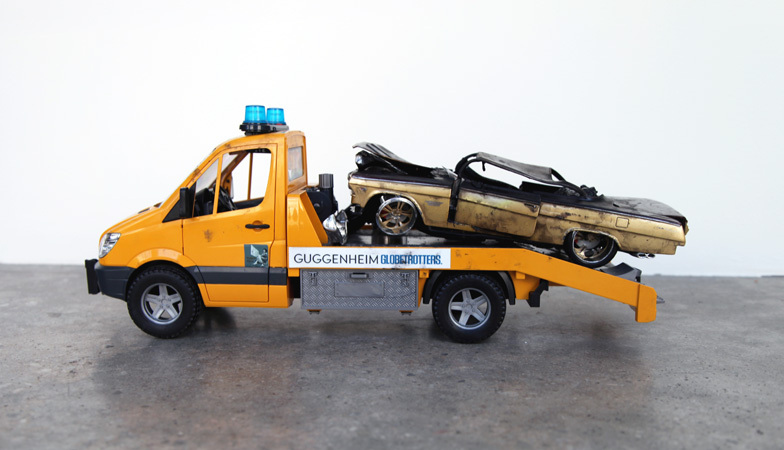 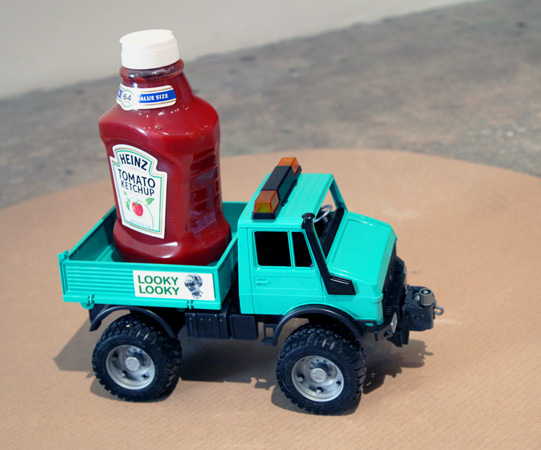 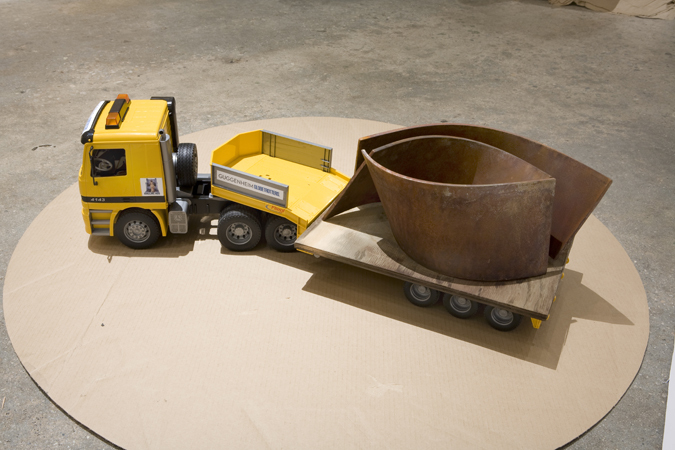 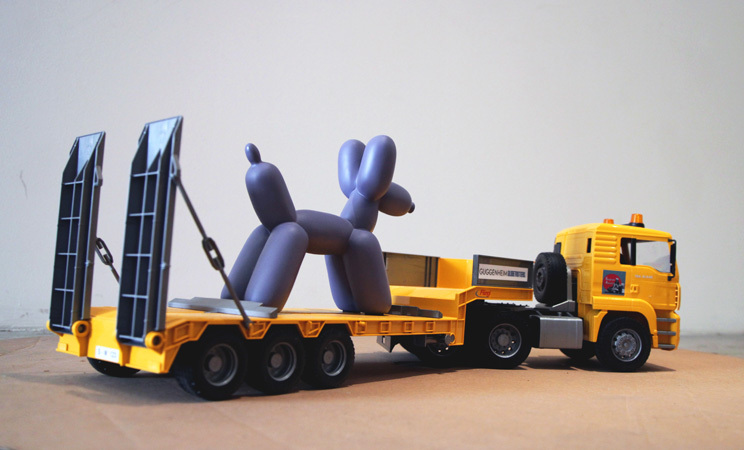 The setting includes ten miniature transport trucks carrying iconic works of contemporary art (Serra, Koons, Kapoor, Oldenburg, McCarthy, etc) to a distant desert location; a miniature billboard featuring a patriotic advertisement and a bomb-destroyed Libyan Down Syndrome Center. 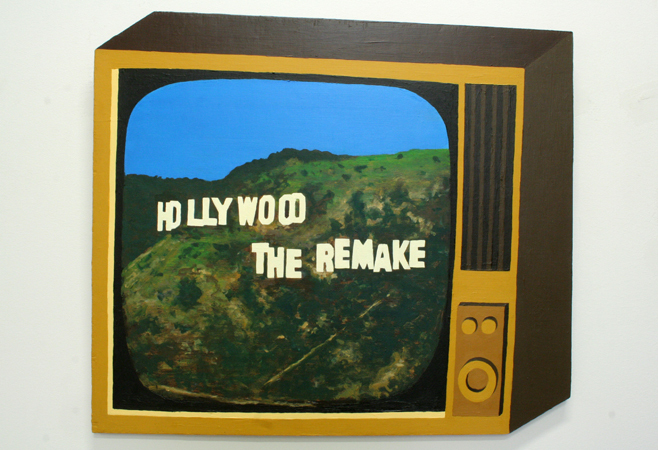 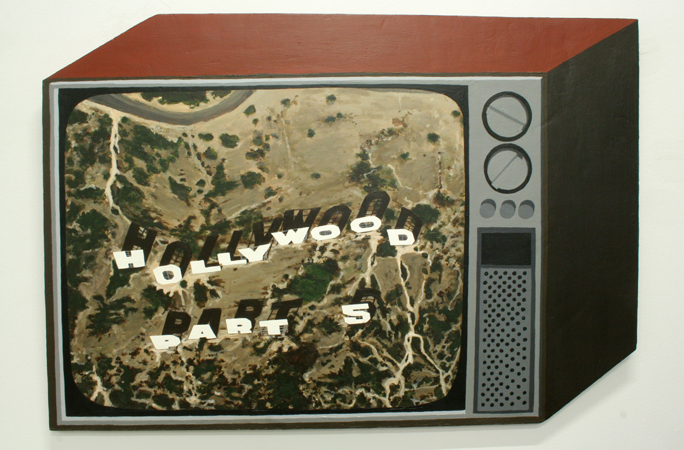 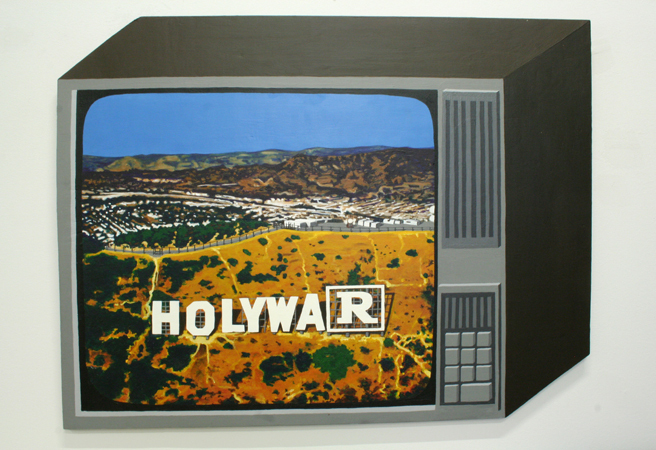 In addition Lahart will present a group of “television set” paintings created in Dublin while anticipating his current two-month Los Angeles residency. 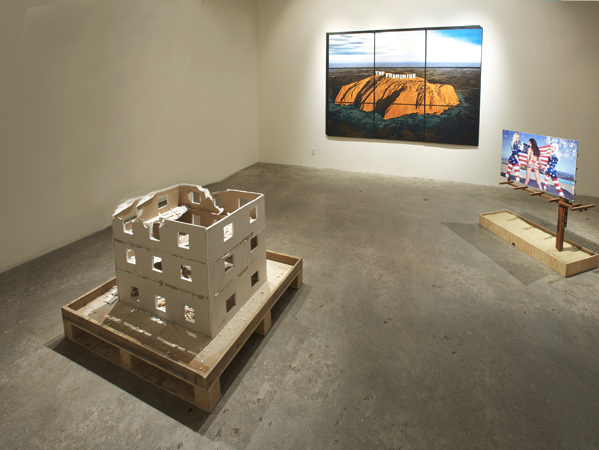 Lahart works in a wide range of media including painting, sculpture, installation, video and performance. 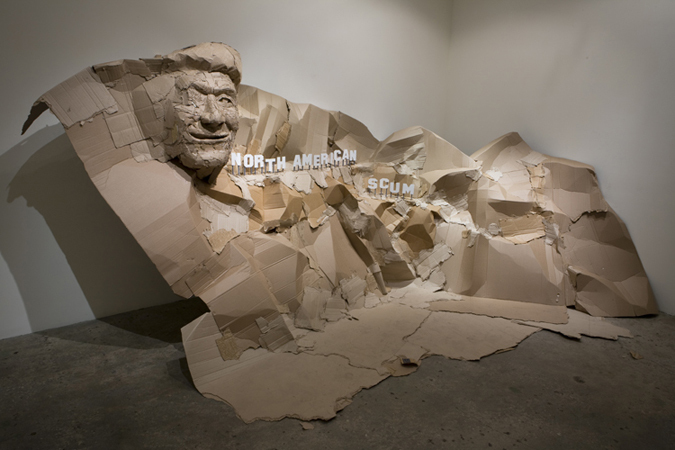 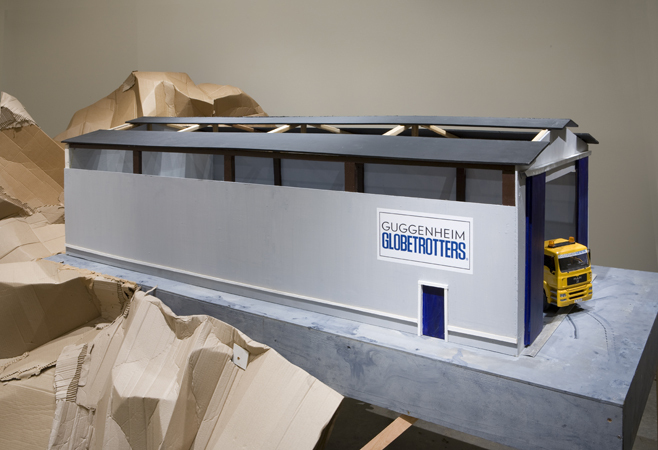 As he puts it, “I like to make fast work from speedy ideas and when traveling to the United States I like to follow the bumpy road to the dark side of Mount Rushmore.” The current show alludes to Peggy Guggenheim and the Harlem Globetrotters to comment on the role that art plays in neo-liberal cultural propaganda. 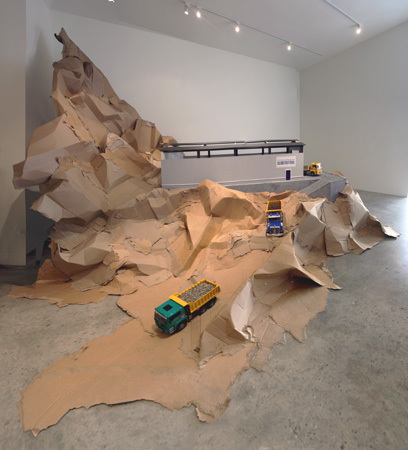 Born in Kilkenny, Ireland in 1973, Lahart earned an MA at the National College of Art and Design, Dublin (2003) and has had solo exhibitions at Catalyst Arts, Belfast (2010); the Royal Hibernian Academy, Dublin (2010) and at Kevin Kavanagh, Dublin (2009) and his work is currently included in Dublin Contemporary 2011.